In 1987, Barb, with Michael Parker and Arnold Brown, and with the administrative assistance and support of friend and writer Abi Grant took a show of comedy and songs to the Edinburgh Festival and amazingly, won the Perrier award. Songs were originals by Jungr and Parker and Jungr, Parker and Brown and included ‘Glasgow - My Kind Of Town’. In 1991, Barb with Michael Parker, Christine Collister and Ian Shaw, collected songs on the theme of death and dying. Nica Burns took the show up and produced it for the Edinburgh festival. It moved many people, was featured on some local TV shows and was invited to the Purcell season of ‘Pick’s Of The Fringe’ in London. Songs included ‘No Restricted Signs In Heaven’, ‘Everything I Own’, ‘Jessie’, ‘Eleanor Rigby’ and ‘My Old Man’s Got A Coffin Just Your Size’. In 1992 the Hell Bent team were invited to the Canadian festivals in Winnipeg and Vancouver. Ian Shaw being unavailable singer Helen Watson joined and the theme this time was money. The group recorded a cassette of the songs for Harbourtown records and briefly toured the show in the UK. Songs included Paul Simon’s ‘America’, ‘I’ll Take Good Care Of You’, ‘One Meatball’ and ‘You’ve Got To Pick A Pocket Or Two’. 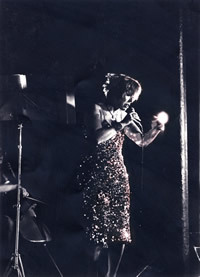 In 1995 Barb worked on her first solo performance with Russell Churney on piano. Opening at The King’s Head Theatre in north London it featured a collection of left field love songs with a more dramatic presentation, lighting and theatrical staging than Jungr had previously used outside of her work with Julian Clary and which would become a feature of her future works. Songs included ‘Another Suitcase’, ‘Ne Me Quitte Pas’ and ‘The Ballad Of Lucy Jordan’. 1996 saw Jungr working once again with Russell Churney this time on a theme close to Jungr’s heart in an exploration of songs including ‘Miss Otis Regrets’, ‘If’, ‘Psycho killer’, Leonard Cohen’s ‘The Future’ and Dave Van Ronk’s ‘Hang Me Oh Hang Me’. The show opened at The Old Town Hall Hemel Hempstead before touring and was at the Cochrane Theatre in London. In 1998 writer and director Julia Pascal suggested Jungr perform a more obviously theatrical work and commissioned several well known women writers to present monologues for Jungr. Texts included work by Fay Weldon, Pascal and Adrienne Blue and songs included ‘Ain’t Necessarily So’, ‘Feelin’ Good’ and ‘I Know What I Know’. The show played a three week run at The Edinburgh festival after opening at The Hampstead Theatre in London and subsequently toured the UK. 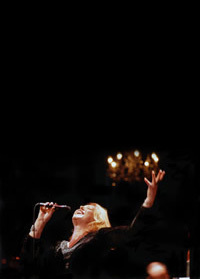 Barb returned to Edinburgh in 1999 to perform for three weeks with this show which featured repertoire from her Irregular Record’s CD. The show included songs which had often been audience favourites and included Kristofferson’s ‘Me And Bobby McGhee’ and ‘Waterloo Sunset’. In 2000 Barb and Mari made a collection of their favourite old soul and jazz songs for a musical collaboration which has continued to the present day. Songs include ‘One Girl Too Late’, ‘You’re No Good’ and ‘Yeah Yeah’. With the involvement of Linn Records Barb was able to stage her collection of new translations of French chansons with the unique accordion performances of Kim Burton, Russell Churney on piano and Julie Walkington on bass. The show played for 3 weeks at the Edinburgh Festival before touring the UK and was invited to the Arts and Music festival in Korea in November of 2001. In 2002 Linn Records released Barb’s collection of Bob Dylan’s songs and a two week run at London’s Soho Theatre launched the show and CD. The extensive tour featured Julie Walkington on bass, Jenny Carr on piano and Sonia Oakes on cello . Christof Bracher played percussion in London and at some live shows. In 2002 the producer Richard Stirling asked Barb to perform a two week run at The Jermyn Street Theatre, for which she brought together a collection of songs by both Brel and Dylan, with MD and accompanist Russell Churney. The show received terrific reviews and is often requested and still performed today. Songs include ‘ne Me Quitte Pas’, ‘Chanson de Jackie’, ‘Not Dark Yet’ and ‘Tangled Up In Blue’. With singer and friend Claire Martin, Barb created a collection of songs which toured and played at the Aldeburgh and Salisbury Festivals in 2003. Gareth Williams played piano with Laurie Cottell on bass. Songs included ‘free Man In Paris’, ‘Chain Of Fools’ and ‘Woman’. 2003 saw the release of Barb’s record centred around the theme of clowns and titled with a new Adrian York arrangement of Waterloo Sunset. The album was launched with a week at Ronnie Scott’s Jazz Club in London, and the band included Matt Backer on guitar, Nik France on drums and Geoff Gascoigne on bass. MD and pianist was Adrian York. Currently in production, 2005 sees the launch of the new Linn CD and show of the same name. The show is touring the UK and has been invited to play in New York in the autumn of 2005. Lighting is by Nick Flintoff, arrangements by Adrian York and Jonathan Cooper.